A must-see movie before the holiday ends. I’m pretty skeptical when it comes to movies. I typically go into a movie assuming that I’m not going to like it. Of course, if it happens to star Gerard Butler, Orlando Bloom, or any of the Avengers, I’m usually first in line. This holiday season was no exception. When my husband and 4 kids were all dying to see The Muppets, I tagged along, knowing full well that I wasn’t really going to enjoy it. After all, The Muppets hadn’t put out a good film since Muppet Christmas Carol in 1992, which happens to be one of my all time favorite Christmas movies. Much to my content, The Muppets did not disappoint. As a child of the 70’s and early 80’s, I grew up with The Muppet Show as regular part of my weekly routine. Pigs in Space, cooking segments from the Swedish Chef, and science experiments from Dr. Bunsen Honeydew and Beaker were something I looked forward to every weekend. And The Muppets did an amazing job of helping my relive parts of my 80’s childhood. A majority of kids born into the year 2000 or later have no idea how amazing The Muppets were in their heyday. So it seemed so aptly appropriate for The Muppets to seem like “losers” as the movie started off. However, us 30-somethings knew far too well that they weren’t, aren’t and wouldn’t be losers for long. The film had me sucked in from the moment it began with its broadway-style like production including Jason Segel dancing and singing down the street to “Life’s a Happy Song.” Amy Adams always looks amazing, but her 1950’s styled costumes were so gorgeous that she just seemed to glow. 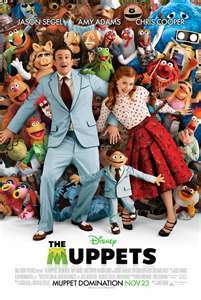 Complete with numerous cameos including, Neil Patrick Harris, John Krasinski, and Mickey Rooney, this movie went back to its Muppets roots and had me laughing from beginning to end. As with any good movie, I typically find multiple moments of happiness in the form of tears, but the highlight for me was “Rainbow Connection” sung by Kermit. I don’t remember the last time I cried so hard during a film. I even my kids questioning if I was going to be OK or not. Fortunately, for you, it’s not too late to see this movie in theaters. Just go to fandango to see showtimes and locations. With or without kids, it’s just plain fun, and more important, super quotable. I hope you enjoy it as much as I did! I’ve always kind of felt sorry for the underdog. The loser. The one who you know won’t come out on top. I find myself cheering for them. Routing them on. “Come on, you can do it!” I don’t know why, maybe it’s because I’m sensitive or because I can easily put myself in other people’s shoes. Yesterday I was wholeheartedly cheering for the underdog – just in a different way. I came upon this video of a couple of college students putting on a sports cast. Yes, I was cheering for them. Cheering for them to keep messing up! Yes, I know it sounds really bad. But this video is so over-the-top funny that I couldn’t help but find happiness in their misery. I’m sure that neither of them will ever read this. And I’m sure that this isn’t the first or the last time this will ever be said about them. But this video is so bad that I just kept wanting to see more. More stutters. More stumbles. More confusion. Well, you’ll see what I mean when you watch it. And just a fyi to future sports casters: Do NOT do any of this! Click the link, then enjoy! Amazingly Awkward Sportscaster – CollegeHumor – VideoWired.com – Get Wired!. My daughter’s strange affection for balloons. Most kids love balloons. You see balloons at kid’s birthday parties, kid’s restaurants, kid’s fairs. Kids love to draw balloons and throw ones filled with water. In fact given any opportunity, most kids would choose to carry balloons around with them wherever they go. But my daughter isn’t like most kids. She loves balloons. Inside. But as soon as she steps outdoors with one, she goes into a near breakdown. She is so worried, that by chance, it will blow away. I’m not sure if she thinks it’s going to get sucked into some weird vortex and then haunt her dreams at night. Well her madness is our pleasure. It may sound mean, but watching her go into hysterics is actually pretty hysterical! But I want everyone to share in my giddyness with this video. This was from about a month ago when, once again, she got a balloon and her fear that it would be swiped out of the car with a hurricane-force wind would happen, even though it never does. You will see her try to talk herself down off a ledge in a moment of pure horror. But trust me, it is quite funny. Enjoy!